Reading and share top 945 famous quotes and sayings about Industry by famous authors and people. 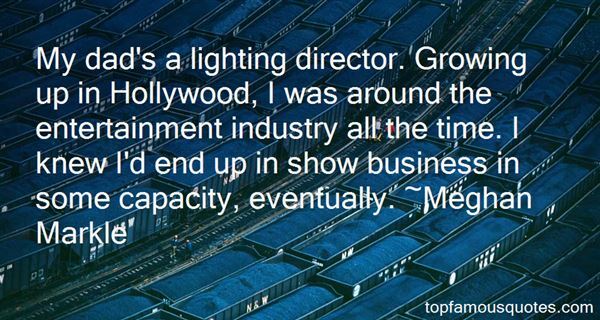 Browse top 945 famous quotes and sayings about Industry by most favorite authors. 1. "I am not a commercial industry creator. I don't believe in making art to make money." 2. "I think it's every girl's dream, a little bit, to be a model because it seems from the outside to be a glamorous industry and I was really into fashion, and I remember just being excited and wanting to be part of that." 3. "Nothing retains less of desire in art, in science, than this will to industry, booty, possession." 4. "Fashion is quite inclusive and good at embracing different things and different forms of beauty. It's a very liberal industry. You can be yourself. Just not overweight." 5. "Our film industry as well as the audiences are now open to unconventional pairings and subjects, which has aided my journey greatly." 6. "In the mid 1990s the Korean film industry was really open-minded." 7. "The health care industry can play a great role in this by being aware of the fact that these children form perhaps the most neglected group of people in the country, largely because it is hard to find them." 8. "I came to the industry with wide eyes and an open heart thinking I was going to make a few films that really meant something that I could pour myself into." 9. "The peoples of civilization see their wretchedness increase in direct proportion to the advance of industry." 10. "We Liberal Democrats believe in dialogue. We believe in cooperation with both sides of industry and between both sides of industry. And we believe in the language of cooperation. We reject the language of confrontation." 11. "I'm proud of my roots. There are not many Asians in the music industry so it's important for me to tell people where I'm from." 12. "New Orleans is a city whose basic industry is the service industry. That's why it makes its money. That's - it brings people to the city. People come to the city and experience the wonders of this extraordinary city and everything else. The question is that, how do we create jobs which are the jobs that have pay, that - living wages?" 13. "From this entertainment industry, may the gods of language protect us." 14. "If we went back to the imprisonment rate we had in the early '70s, something like four out of five people employed in the prison industry would lose their jobs. That's what you're up against." 15. "I read real books. On paper. You know, those printed books? I feel like this is the last thing I do to support my industry. I think they smell great, too." 16. "Some said he shouldn't save Detroit. But President Obama made the tough and right call to save more than a million American jobs in an important, iconic industry." 17. "Now I don't know if you realize it, but the film industry's a small world. It's like living in a tenement at one end of a back alley. Not only do you see everybody's dirty laundry, but once rumors start, you can't stop 'em." 18. "We are going to punish somebody for this attack, but just who or where will be blown to smithereens for it is hard to say. Maybe Afghanistan, maybe Pakistan or Iraq, or possibly all three at once. Who knows? Not even the Generals in what remains of the Pentagon or the New York papers calling for war seem to know who did it or where to look for them.This is going to be a very expensive war, and Victory is not guaranteed--for anyone, and certainly not for a baffled little creep like George W. Bush. All he knows is that his father started the war a long time ago, and that he, the goofy child President, has been chosen by Fate and the global Oil industry to finish it off." 19. "Here's a little jingle I wrote about mulch:	Mulch--sprinkle, sprinkle, dance, dance, use it with a friend, and use it on your plants. (Not a paid advertisement by the mulching industry)"
20. "The mutual fund industry provided the money for Intel and Motorola and Hewlett-Packard to crush the competitors." 21. "While the men of the steel industry were going through blood and gas in defense of their rights and their homes and their families, elsewhere on the far-flung C.I.O. front the hosts of labor were advancing and intelligent and permanent progress was being made." 22. "I also thought of myself as the Sonny Barger of the film industry." 23. "The NRA provided that in America each industry should be organized into a federally supervised trade association. It was not called a corporative. It was called a Code Authority." 24. "In her mind the U.S. was nothing more and nothing less than a país overrun by gangsters, putas, and no-accounts. Its cities swarmed with machines and industry, as thick with sinvergüencería as Santo Domingo was with heat, a cuco shod in iron, exhaling fumes, with the glittering promise of coin deep in the cold lightless shaft of its eyes." 25. "It's a political and manipulative industry. Actors vie for the same roles, movies are snatched away. Have I ever been manipulated? Yes. But I haven't manipulated anyone because if you think from the heart, you cannot be calculative. I have spent nights crying." 26. "The sports apparel industry was dominated by the big shoe companies. But there was a void in apparel and I decided to fill it." 27. "I like being a consumer. I'll do collabs with brands I like, only because I would like something free to wear. But I don't want people to dress like me, which is what you're asking when you create a brand. The fashion industry's just a super-duper headache." 28. "Zynga made social gaming and play a worldwide phenomenon, and we remain the industry leader." 29. "It perhaps has a chance, a commercial chance, this film. It's funny, it's charming, the idea is original, it's unusual and it makes fun of the movie industry in a way that it needs to be poked fun at." 30. "In fact, the laboratory may be the greatest friend to dumb animals. As science advances, the lives of animals will improve as we depend less and less on their labor and no longer ignore their conditions in order to improve ours. You know, there is much to learn from animals if we are ever to be truly industrial creatures. The beaver is the finest builder of bridges and the silkworm a better weaver than any man or woman. God gave industry perfectly to the caterpillar while we must learn our arts. That is technology--our way to become closer to being like animals." 31. "My dad's a lighting director. Growing up in Hollywood, I was around the entertainment industry all the time. I knew I'd end up in show business in some capacity, eventually." 32. "Much of our food system depends on our not knowing much about it, beyond the price disclosed by the checkout scanner; cheapness and ignorance are mutually reinforcing. And it's a short way from not knowing who's at the other end of your food chain to not caring–to the carelessness of both producers and consumers that characterizes our economy today. Of course, the global economy couldn't very well function without this wall of ignorance and the indifference it breeds. This is why the American food industry and its international counterparts fight to keep their products from telling even the simplest stories–"dolphin safe," "humanely slaughtered," etc.–about how they were produced. The more knowledge people have about the way their food is produced, the more likely it is that their values–and not just "value"–will inform their purchasing decisions." 33. "The elimination of unnecessary collateral requirements on foreign insurers and reinsurers is not only beneficial for the individual companies, but for the industry as a whole." 34. "You know, my degrees are in computer engineering. I spent a lot of time in the tech industry. And I like to say that I don't invest in tech because I spent time in it. And I saw firsthand that the durability of technology moats is many times an oxymoron." 35. "The beef industry has contributed to more American deaths than all the wars of this century, all natural disasters, and all automobile accidents combined." 36. "I love 'Project Runway' because I can really be of help to an industry and I can be supportive to designers." 37. "At first, we couldn't be establishment, because we didn't have any money. We were guerrilla marketers, and we still are, a little bit. But, as we became No. 1 in our industry, we've had to modify our culture and become a bit more planned." 38. "Some of the most morally conscious, kindest, most compassionate people are in the entertainment industry, people who want to affect the world and make it a better place through telling human, heartfelt stories." 39. "A city that had learned to make good bread had learned to make good cake also. A city that built itself up by good sense and industry had formed a powerful secondary intention of elegance." 40. "Writing is such an industry now. In many ways, that's a good thing, in that it removes all the muse-like mystique and makes it a plain old job, accessible to everyone. But with industry comes jargon. I was aware that jargon was starting to fill those growing shelves of Writer's Self Help books, not to mention the blogosphere. Wherever I looked, the writing of a script was being reduced to A, B, C plots, Text and Subtext, Three Act Structure and blah, blah, blah. And I'd think, that's not what writing is! Writing's inside your head! It's thinking! It's every hour of the day, every day of your life, a constant storm of pictures and voices and sometimes, if you're very, very lucky, insight." 41. "Business is a game like baseball or golf or anything else. I enjoy being a student of the game, and reading, and learning, and going to conferences, whether it's building custom homes or selling or servicing medical equipment. A good entrepreneur can be a good entrepreneur in any industry because if you're a good student of the game, the rules and the lessons are very much the same. And that's the fun part about it." 42. "Engaging spirits isn't an elitist ability or industry, it's being active in the connection with All Things. It's innate to us all." 43. "I am far from perfect, but I have something else. I heard that people in the industry are longing for more personality and diversity. Perhaps I am more a 'character' than a model." 44. "Humans lived for several million years as fully wild beings: only in the last 10, 000 did we invent agriculture; only in the last couple of centuries did we invent industry. We are a species that has spent 99 per cent of its history as hunter-gatherers. We haven't had time for our unconscious minds and our unconscious needs to have changed. If you like, our souls have not changed, and this is true whether or not we believe that we have them." 45. "The rapid growth in many of our suburbs has spawned a booming construction industry eager to hire low wage immigrants who gladly fill these jobs, many of them happy to be paid in cash, free of federal and state taxes." 46. 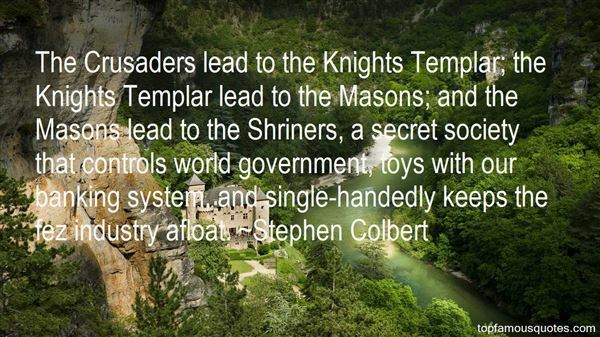 "The Crusaders lead to the Knights Templar; the Knights Templar lead to the Masons; and the Masons lead to the Shriners, a secret society that controls world government, toys with our banking system, and single-handedly keeps the fez industry afloat." 48. "What We want is to make it possible for our unfortunate people to live a life of industry for it is by steady work alone that we hope for our physical and moral rehabilitation. For this reason above all we have undertaken to rally our people around our ideal." 49. "Future is mobile computing - smartphones and tablets are just elements of it. The industry is on the verge of a whole new paradigm." 50. "A lot of industry groups have said they support a federal law. They don't want to have to deal with 50 different state laws." I'm really just a regular guy who has had an incredibly blessed life." Who Was Talking About "Industry"?